An Economic downturn is bad news for a lot of people but for the Employees Provident Fund (EPF), it is music to its ears. The pension fund, which has more than RM330 billion of assets, is eager to snap up bargains, be it in the stock market or the property market. "Patience is the name of the game, there's nothing clever about it. For long-term fund like us, this is the time that we have waited for," Johari Abdul Muid, deputy chief executive officer of investment, told Business Times and Berita Harian in an interview recently. As the stock market had fallen some 40 per cent in 2008, the EPF had been buying more shares in companies like SP Setia Bhd, a developer, Petronas Gas Bhd, and Public Bank Bhd, Bursa Malaysia filings show. Although the weak stock market could make it tough for the EPF to maintain its dividend payout for 2008, buying stocks at low prices now could also mean a windfall when the market recovers. Earlier last month, the EPF said its third quarter investment income fell 60 per cent from the second quarter as it set aside more money to cover the lower value of its stock market investments. The EPF has 23.4 per cent of its funds in stocks in the third quarter, the third-biggest asset class after government bonds, loans and corporate bonds. "Everyone's expecting recovery in 2010. You should see some recovery maybe middle of next year (2009), end of next year (2009)," he said. The EPF also wants to buy more properties, a segment of which its investment is far short of what has been recommended by consultants. It can invest up to three per cent of its total but has spent only one per cent. "There's quite a number of buildings that will probably be up for sale soon. Things are tough and cash is tight. I expect more sellers than buyers," Johari added. Johari said he has been sending out his staff to find "good properties" for the last two months. Surprisingly, the fund has not been approached by potential sellers despite it being a natural candidate as it is flush with cash. "Maybe they don't see us as a property player," he said. The EPF has bought several choice assets in recent years, notably Wisma KFC and the Sogo shopping mall in Kuala Lumpur. These have been delivering good rental returns while other properties offer the chance for redevelopment. An example is the training academy for Malaysia Airlines in Kelana Jaya which it bought for RM145 million in 2007. "We see the potential of that piece of land. It is perfect land for redevelopment," he said. The Employees Provident Fund (EPF) may bid for Menara Citibank, a prominent building in the heart of Kuala Lumpur, as it feels that now is the time to increase its property collection. "We are enquiring ... I can consider (bidding)," Johari Abdul Muid, deputy chief executive officer of investment, told Business Times and Berita Harian in an interview recently. Menara Citibank, a 50-storey building that is almost fully occupied, is up for sale again after IOI Corp Bhd called off its purchase that was priced at RM586.73 million. IOI backed out of the deal in November, forfeiting its RM73.36 million deposit paid to Inverfin Sdn Bhd, citing concern over the economy. Inverfin is 50 per cent owned by Menara Citi Holding Co Sdn Bhd, a unit of US bank Citigroup. Singapore's CapitaLand Ltd holds another 30 per cent, while Amsteel Corp Bhd owns the rest. "When it comes to buildings, we have a clear-cut policy to deal with more prominent ones," Johari said. In May, the pension fund bought the 26 Boulevard building in Precinct 3, Putrajaya, from Putrajaya Holdings Sdn Bhd. More than 90 per cent of the office and retail space in the building has been taken up by government departments and companies. 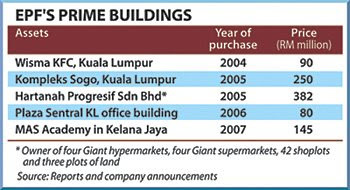 EPF invested RM1.78 billion in real estate in 2007, or just 0.6 per cent of its total investments. Its portfolio includes properties such as the Sogo shopping mall, Wisma KFC and a building in KL Sentral. Menara Citibank has a net lettable area of 733,626 sq ft and 99 per cent occupancy rate. The net book value of the building as of December 31 2007 is RM458 million and the gross rental revenue is RM43.3 million (excluding revenue from the car park of RM3.3 million). The Employees Provident Fund (EPF) plans to bid for the government's prime land in the Klang Valley as it seeks to boost its property investment and improve returns to its members, a senior official said. The pension fund, which manages some RM332.4 billion currently, has invested only one per cent of its total in properties so far and it is keen for more. "Of course we'll be interested. We are in a position to consider big tracts of land," Johari Abdul Muid, the deputy chief executive officer for investment, told Business Times and Berita Harian in an interview recently. On November 4 2008, Deputy Prime Minister Datuk Seri Najib Razak said that companies will be allowed to develop government land under an open tender system. It is part of the government's plan to raise funds and boost a slowing economy. The centrepiece asset is the 1,600ha owned by the Rubber Research Institute Malaysia in Sungai Buloh, Selangor. The land is located next to the thriving Kota Damansara area. Other possible areas for development include land in Jalan Cochrane and Jalan Ampang Hilir, which is also strategic as it is close to the Petronas Twin Towers. 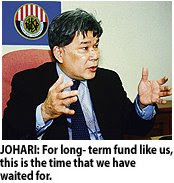 The EPF can invest up to three per cent of its funds, or some RM10 billion, in properties like buildings or even land. It has invested about RM3.3 billion or one per cent, so far, Johari said. "We have, in our normal presentation of investment (to the government), said that we are a bit short from the property perspective," he said, adding that the EPF will follow the government's decision. This means that if the land is auctioned, it will bid for them. He explained that the EPF can buy the land on its own and then develop it in partnership with property companies. Details of the government's plans with the land are being finalised by the Economic Planning Unit. Mutiara Goodyear Development Bhd is consolidating itself and realigning its focus and resources so it can seize opportunities when the property market recovers, says chief executive officer Kee Cheng Teik. What is your outlook for the property market? The Malaysian economy has been resilient in the first half of 2008, but is increasingly being affected by the global downturn. Consumer demand for properties has slowed down from the third quarter of 2008 due to the market uncertainties and we expect this to continue in 2009. But we are happy with the measures introduced by the Government to spur the local property market. Incentives such as the abolishment of the real property gain tax and the elimination of Foreign Investment Committee approval for foreign purchases of residential properties above RM250,000 are among positive signs that will spur the primary and secondary property market in the short to medium term. Furthermore, we applaud the Government’s move to allow savings in the Employees Provident Fund to be used for monthly repayments of housing loans as this will stimulate consumer spending and house ownership, besides easing the burden of paying monthly loan instalment by home owners. In addition, the Government just recently announced a stimulus package worth RM7bil, a large chunk of which will be allocated to the housing and construction sector. The Government has removed import duties for cement and long iron and steel products, and also abolished approved permits for long iron and steel products, making these building materials more competitively priced. While these incentives are very much welcomed, markets may remain volatile for some time — more so because the present crisis is of global proportions. So even with the stimulus package, it may take a while before the measures kick in and the market pick up again. We view property based on its long-term prospects as a property development cycle encompasses at least three years; from the initial study phase to completion. Hence, even though the property market’s short-term prospects are uncertain; we are bullish over its long term prospects. The success of a property development is based on location and a well-managed cost structure. In times of uncertainty, optimum cashflow management takes precedence in a development to ensure an increase in asset value. Going forward, at least in the medium term, the Malaysian property market will still be largely led by high end residential properties but it will naturally spill over to medium range properties as well. What are the challenges ahead for the company, especially in a slowing economy? Our challenge for the coming years is to enhance the value of our assets, manage cashflow, and put all our development plans in order so that we can take advantage of the market when the timing is right to launch. We are still seeking to increase our landbank in key markets either via joint ventures or strategic partnerships. We will take this opportunity to consolidate ourselves and to realign our focus and resources. We believe when the market recovers, the opportunity will arise and we want to be in a position to ride on the opportunity. What are the new launches the company plans to undertake in the Klang Valley and Seberang Perai? • A commercial development in Sunway Commercial centre. These projects are expected to carry an overall gross development value (GDV) of more than RM2.5bil. How have the recent launches fared? Mutiara recently launched a 1.38ha commercial development project, Prima Avenue in Dataran Prima, Kelana Jaya. This modern contemporary development incorporates two blocks of 15-and 16-storey freehold commercial office tower with a retail podium called The Tube. We have received overwhelming response for the duplex units at The Tube while interest in the office suites has been very encouraging. As of to date, more than 70% of the first block launched in September has been fully taken up. What is your current landbank? Mutiara has a total of about 356.4ha of landbank in Penang and the Klang Valley with an estimated total GDV of RM4.1bil when fully developed. KUALA LUMPUR: Parkson Haiphong Co Ltd has signed a sale and purchase agreement with Thuy Duong Investment Joint Stock Co to acquire a property in Vietnam for US$24.15mil. Parkson Haiphong is a wholly-owned subsidiary of Parkson Holdings Bhd. In a filing to Bursa Malaysia, Parkson Holdings said the proposed acquisition was to enhance the earnings of the group and was also in line with the company’s objective of owning key operating outlets. It said the proposed acquisition would result in net incremental savings in terms of rental otherwise payable and additional income from the entertainment centre. “The property is situated in a strategic and high growth development area which augurs well for future expansion and the Parkson Holdings group will be able to benefit from any capital appreciation in connection with the property,” it said. Parkson Holdings said the funding for the proposed acquisition would be sourced from internally-generated funds and/or from bank borrowings. “The proposed acquisition is expected to be completed by the first quarter of 2009,” it said.